Lorelei Hotel | This and that from re Thai r ment. In the last few days I read in the editorial pages of the Bangkok Post, one of the two major english language newspapers in Thailand, that, as I surmised, the military is in firm control of the governmental process through an organization set up following the Red Shirt demonstrations to manage the post demonstration investigation process. This probably means that any reconciliation process must go through the military and assure its interests are protected. Also, several articles over the past month have criticized the Police, competitors to the military in the Thai governmental system for their less than enthusiastic behavior in putting down the protests. Today’s photograph. While trolling the internet, I came across a site that pro-ported to identify the 10 or so best restaurant views in the world. 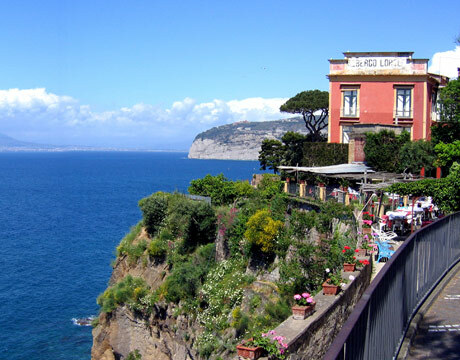 One of them was of the Lorelei Hotel in Sorrento, Italy. What makes this significant to me is that at least 5 generations of my family have stayed at this hotel, most recently my son and daughter. In my last visit I stayed in the room on the upper left. My daughter and Margaret Azevedo stayed in the room behind that one. The Hotel, when we stayed there almost 20 years ago, had fallen a bit on hard times.